Tomás Mac Curtain (20 March 1884 – 20 March 1920) was a Sinn Fein Lord Mayor of cork city,Ireland.. He was elected in January 1920. He was born at Ballyknockane in the Parish of Mourne abbey in March 1884. He attended Burnfort National School. In 1897 the family moved to Blackpool on the northside of Cork city (corcaigh) where he attended The North Monastery school.. Mac Curtain became active in numerous cultural and political movements from the turn of the nineteenth century when he joined the Blackpool, Cork branch of Conradh na Gaeilge(the Gaelic League), becoming its secretary in 1902. He had diverse interests in music, poetry, history, archaeology and Irish history. He worked in his early career as a clerk and in his free time taught Irish to those who wished to learn. In 1911 he joined the Fianna Eireann and was a founding member of the Irish Volunteers . BACK: P. Cotter, Sean Nolan, Dathi Cotter, Sean Scanlan, Fred Murray. CENTER: Tom O’Sullivan & Diarmuid O’Shea (with rifles), Tom Barry, Pat Corkery, Donal Barrett, Donal Og O’Callaghan, Tadg Barry, Diarmud Lynch, Con Twomey (with rifle) FRONT: Sean Murphy, Tomas MacCurtain, Sean McDermot, Herbert Moore Pim, Sean O’Sullivan, Sean O’Murthille. He met Eilish Walsh (Eibhlís Breathnach) at a Gaelic League meeting and they married in 1908. They had six children, five of whom survived into adulthood. 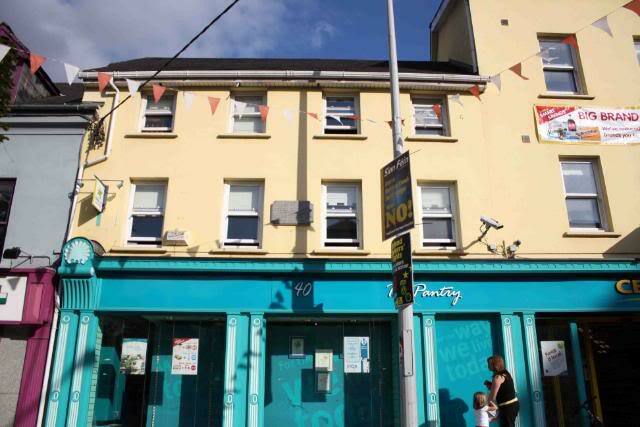 The family lived over number 40 Thomas Davis Street where Tomás had a small clothing and rainwear factory. In April 1916 at the outset of the Easter Rising Mac Curtain commanded a force of up to 1,000 men of the Irish Volunteers who assembled at various locationsaround County Cork. 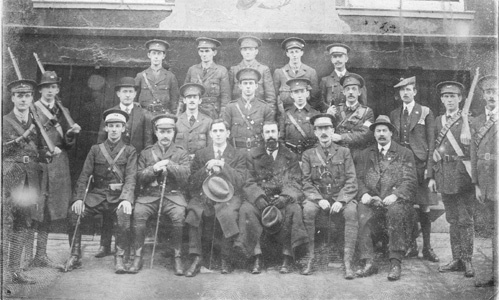 From the volunteers headquarters at Sheare’s Street in the city, Mac Curtain and his officers awaited orders from the volunteer leadership in Dublin but conflicting instructions and confusion prevailed and as a result the Cork volunteers never entered the fray. A tense stand-off developed when British forces surrounded the volunteer hall and continued for a week until a negotiated agreement led to the surrender of the volunteers’ arms to the then Lord Mayor of Cork Thomas Butterfield on the understanding that they would be returned at a later date. This did not happen however and Mac Curtain was jailed in the former Frongoch Prisoner of War camp in Wales. After the general amnesty of participants in the Rising 18 months later Mac Curtain returned to active duty as a Commandant of what was now the Irish republican Army . He was elected in the January 1920 council elections as the Sinn Féin councillor for NW Ward No. 3 of Cork, and was chosen by his fellow councillors to be the Lord Mayor. He began a process of political reform within the city, making changes to the way in which the council operated and was run. In January 1919 the Anglo-Irish war started and Mac Curtain became an officer in the IRA . On 20 March 1920, his 36th birthday, Mac Curtain was shot dead in front of his wife and son by a group of men with blackened faces, who were found to be members of the Royal Irish constabulary (RIC) by the official inquest into the event. In the wake of the killing which was in revenge for the shooting of a policeman, Mac Curtain’s house in the city’s Blackpool area, was ransacked. THE LOCATION WHERE Tomás Mac Curtain WAS ASSASSINATED, THERE IS A PLAQUE TO COMMEMORATE Tomás Mac Curtain ON THE UPPER STORY. The killing caused widespread public outrage. The coroner’s inquest passed a verdict of wilful murder against British Prime Minister Lloyd George and against certain members of the RIC. The IRA later killed the man who ordered the attack, District Inspector Oswald Swanzy, in Lisburn, County Antrim ,on 22 August 1920 using Mac Curtain’s personal handgun, sparking a pogrom of Catholics in the town. Mac Curtain is buried in St. Finbarrs Cemetery, Cork. 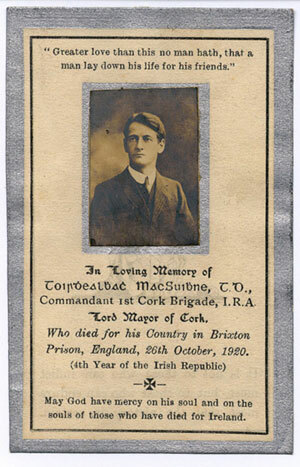 His successor to the position of Lord Mayor, Terence MacSwiney, died while on hunger strike in Brixton prison, London. Mac Curtain’s son, Tomás Óg (junior) (1915–1994) later became a leading republican and member of the IRA Executive (whose main purpose was to elect the Chief of staff of the IRA . In January 1940, he was sentenced to death by the De Valera government for mortally wounding Garda John Roche at the end of St. Patrick Street Cork city centre on 3 January 1940. Detective Garda Roche, from Union Quay Barracks, had shadowed him for weeks and following a confrontation, he was shot. However Tomas was granted clemency due to the fact that his father had been killed by the British Army. He was released after seven years. He later served on the IRA executive during the Border Campaign. Terence Joseph MacSwiney (: Traolach Mac Suibhne) (28 March 1879 – 25 October 1920) was an Irish playwright, author and politician. He was elected as Sinn Fein Lord Mayor of Cork , during the Irish War of Independence , in 1920. He was arrested by the British on charges of sedition and imprisoned in Brixton prison in England. His death there in October 1920 after 74 days on hunger strike brought him and the Irish struggle to international attention. MacSwiney was one of eight children. His father, John MacSwiney, of Cork, had volunteered in 1868 to fight as a papal guard against Garibaldi, had been a schoolteacher in London and later opened a tobacco factory in Cork. Following the failure of this business, he emigrated to Australia in 1885 leaving Terence and the other children in the care of their mother and his eldest daughter. [ MacSwiney’s mother, Mary Wilkinson, was an English Catholic with strong Irish nationalist opinions. He was born in kilmurray, county cork and moved to the Cork city as a child. He was educated by the christian Brothers at the North Monastery school in Cork city, but left at fifteen in order to help support the family. He became an accountancy clerk but continued his studies and matriculated successfully. He continued in full time employment while he studied at the Royal University (now University College Cork), graduating with a degree in Mental and Moral Science in 1907. In 1901 he helped to found the Celtic Literary Society, and in 1908 he founded the Cork Dramatic Society with Daniel Corkery and wrote a number of plays for them. He was educated as an accountant and also was a playright , poet ,, and writer of pamphlets on Irish history. His first play The Last Warriors of Coole was produced in 1910. His fifth play The Revolutionist (1915) took the political stand made by a single man as its theme. MacSwiney’s writings in the newspaper Irish freedom brought him to the attention of the Irish republican Brotherhood .He was one of the founders of the Cork Brigade of the Irish Volunteers in 1913, and was President of the Cork branch of Sinn Fein. He founded a newspaper, Fianna Fáil, in 1914, but it was suppressed after only 11 issues. In April 1916, he was intended to be second in command of the Easter Rising in Cork and Kerry, but stood down his forces on the order of Eoin Mac Neill. Following the rising, he was interned under the Defence of the Realm act in Reading and Wakefield Gaols until December 1916. In February 1917 he was deported from Ireland and interned in Shrewsbury and Bromyard internment camps until his release in June 1917. It was during his exile in Bromyard that he married Muriel Murphy of the Cork distillery-owning family. In November 1917, he was arrested in Cork for wearing an IRISH REPUBLICAN ARMY(IRA) uniform, and, inspired by the example of Thomas Ashe, went on a hunger strike for 3 days prior to his release. In the 1918 General Election ,, MacSwiney was returned unopposed to the first Dail Eireann as Sinn Fein representative for Mid Cork, succeeding the Nationalist MP D.D. Sheehan. After the murder of his friend Tomas Mac Curtain ,, the Lord mayor of Cork ,on 20 March 1920, MacSwiney was elected as Lord Mayor. On 12 August 1920, he was arrested in Dublin for possession of seditious articles and documents, and also possession of a cipher key. He was summarily tried by court martial on 16 August, sentenced to two years’ imprisonment in Brixton Prison. In prison he immediately started a hunger strike in protest at his internment and the fact that he was tried by a military court. Eleven republican prisoners in Cork Jail went on hunger strike at the same time. On 26 August, the cabinet stated that “the release of the Lord Mayor would have disastrous results in Ireland and would probably lead to a mutiny of both military and police in South of Ireland.” MacSwiney’s hunger strike gained world attention. The British government was threatened with a boycott of British goods by Americans, while four countries in South America appealed to the Pope to intervene. Protests were held in Germany and France as well. An Australian member of Parliament Hugh Mahon, was expelled from the Australian parliament for “seditious and disloyal utterances at a public meeting” after protesting the actions of the British government in the Australian Parliament. Attempts at force-feeding MacSwiney were undertaken in the final days of his strike. On 20 October 1920, he fell into a coma and died five days later after 74 days on hunger strike. His body lay in Southwark Cathedral in London where 30,000 people filed past it.Fearing large-scale demonstrations in Dublin, the authorities diverted his coffin directly to Cork and his funeral there on 31 October attracted huge crowds. Terence MacSwiney is buried in the Republican plot in Saint Finbarr’s Cemetery in Cork. Arthur delivered the graveside oration. A collection of his writings, entitled Principles of Freedom, was published posthumously in 1921. It was based upon articles MacSwiney contributed to Irish Freedom during 1911–1912. Nehru, in particular, was influenced by MacSwiney’s example and his writings. Principles of Freedom was translated into various Indian languages including Telugu. The famous Indian revolutionary Bhagat Singh was an admirer of Terence MacSwiney and wrote about him in his memoirs. While in prison during his trial he went on hunger strike to protest the conditions in which Indian revolutionaries were being kept who gave a violent response to the British Raj (unlike Gandhi’s followers who were given fair treatment and good food in prison). Bhagat Singh, in his interview with the Tribune newspaper clearly mentioned MacSwiney as one of his inspirations. When Bhagat Singh’s father petitioned the British government to pardon his son, Bhagat Singh quoted Terence MacSwiney and said “”I am confident that my death will do more to smash the British Empire than my release” and told his father to withdraw the petition. He was executed on March 23, 1931, with two of his comrades, Rajguru and Sukhdev, for killing a British officer. He is also famous for throwing a bomb in the British Central Legislative Assembly in Delhi, India. His sister Mary Mac Swiney took on his seat in the Dáil and spoke against the Anglo-Irish Treaty in January 1922. 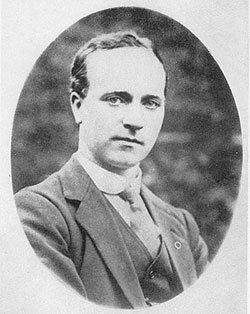 His brother Sean Mac Swiney was also elected in the 1921 elections for another Cork constituency. Seán also opposed the Treaty. In 1945 his only child, Máire MacSwiney, married Ruairi Brugha, son of the anti-treaty cathal Brugha, and later a TD,Member of the European Parliament, and Senator. Máire MacSwiney is the author of a memoir History’s Daughter: A Memoir from the Only Child of Terence MacSwiney (2006). A collection relating to Terence MacSwiney exists in Cork Public Museum. His portrait, and a painting of his funeral mass, by Sir John Lavery are exhibited in Cork’s Crawford Municipal Art gallery. There is also a Secondary School named after him in the north side of Cork City, with a room dedicated to his memory. 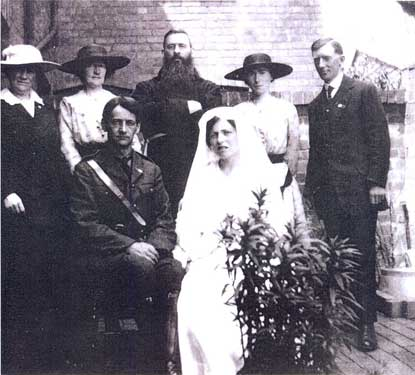 Below : A picture Of Terence Mac Swiney on his wedding day wearing his Irish Volunteers uniform.